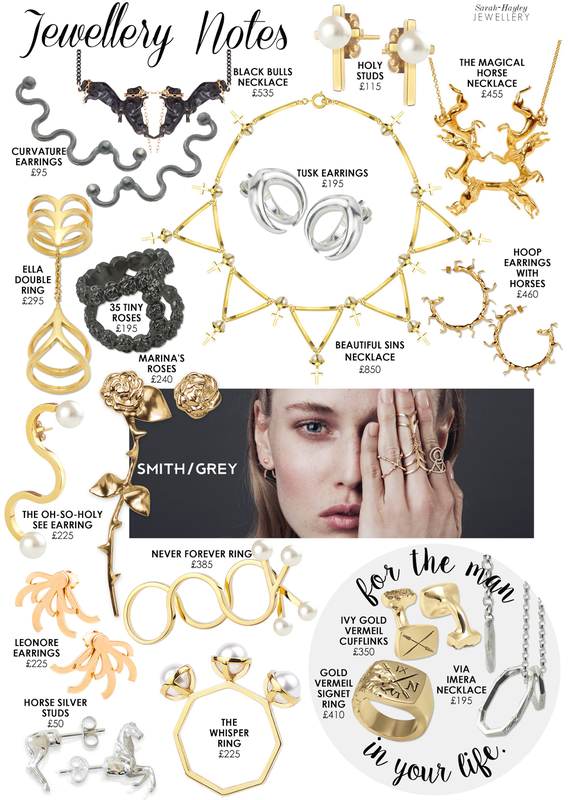 This month's jewellery notes feature the collections by design duo Smith/Grey. Birgit Marie Schmidt and Sofus Graae create pieces as a creative expression of their European and Scandinavian roots combined with their British education and London lifestyle. Impeccably crafted, I instantly fell for their contemporary collections. I first saw 'Marina's Roses' a beautiful asymmetric pair of earrings, featuring one rose stem and one rose stud, worn by a friend of mine. The designers name wasn't known by her as the item was bought for her as a present, after a little research I thankfully found Smith/Grey and discovered more of the 'Bulls & Roses' collection, from which the earrings belong. Smith/Grey offer a diverse selection of jewellery for women and the brand also caters for men. My favourite item for men is the signet ring because of its unique quality. Each ring is textured individually, making each piece one of a kind. With a variety of stockists from Wolf & Badger and Boticca to Harrods and Avenue 32, Smith/Grey are destined for greater success.